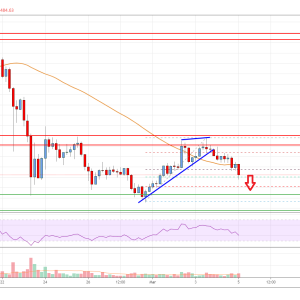 Litecoin price failed to stay above the crucial $75.20 support and extended losses against the US Dollar. LTC price tested the $70.40 level and it remains at a risk of more losses. There is a major bearish trend line in place with resistance at $76.20 on the 4-hours chart of the LTC/USD pair (data feed...The post Litecoin (LTC) Price Remains At Risk Of More Losses appeared first on Live Bitcoin News.